This post is part of a virtual book tour organized by Goddess Fish Promotions. Reut will be awarding a $20 Amazon or B/N GC to a randomly drawn winner via rafflecopter during the tour. Click on the tour banner to see the other stops on the tour. This book is all about the warm crunch: pesto, fettuccine, pad thai, and even coconut chicken, all in their raw vegan version. It’s a great way to have a quick, impressive healthy meal. 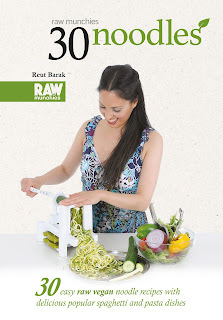 30 recipes for 30 days of a spiralizing adventure. It’s a whole new way of cooking! Cut the coconut meat into 1½ inch (4 centimeter) pieces and marinade with olive oil, coconut aminos, and Chicken Curry Masala for half an hour. For spicier taste, you can add more Chicken Curry Masala. In a food processor or high-speed blender, blend all Sauce ingredients. Chop fresh coriander, and slice the bell pepper. Then mix with meat, and sauce. Marinade for at least 3 hours. You can also marinade overnight for a strong taste. Carefully heat to 108 degrees Fahrenheit (42 degrees Celsius), using a thermometer to check and ensure the temperature doesn’t go higher. RawMunchies.org is a raw vegan website dedicated to making healthy, gluten free recipes, that are delicious, easy and great for detox. Reut Barak has been an online influencer in the Raw Vegan world since her transformation in 2015, “I started cooking when I was 7, on my own making Challah bread. I was brave. The result was what could only be described as beginners luck. I have since had every possible failure in the book (and some of my own). But I always succeeded in the end, and over the 25 years in the kitchen I mastered cooking. I could make anything I wanted to make. Until I went raw. Thank you :) You can also get a lot of free recipes on rawmunchie.org/recipes. Happy Friday, thanks for sharing!